With the internet era and the advent of social media, entrepreneurs are increasingly aware of the potential of using online marketing channels, gaining visibility, networking and creating quality leads. The traditional techniques of outbound marketing (eg, direct mailing or printed advertising) are becoming less effective, and companies are transforming their marketing efforts to focus more on programs that allow customers to find them. Therefore, the ability to use social media effectively is becoming a fundamental part of any business strategy. 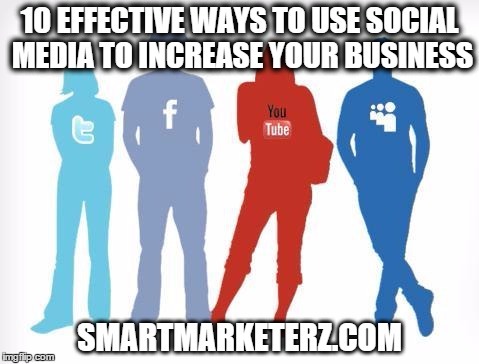 Below you may read how you can use social media in order to improve your online presence, connect with your audience and increase your business. You have to find the social media networks that best meet your needs and invest your time to create pages and profiles for your business. Use sites like Twitter, Facebook, Google Plus and LinkedIn to build communication with your potential readers and visitors or customers. Be sure to understand your audience and look for places where you can find new potential customers. You need to explain to the people what you or your business are doing. Announcing the updates and the release of new services or products. The constant creation of interesting content will be a demand for the products before they are released and still allow your users to return to your profiles in order to find new and interesting content. Talk with your audience. Create a two-way line of communication with your users and listen to what they have to say about you, your products or services. Show your audience that you appreciate the feedback and invest your time to answer to any questions in order to build trust. Tip: Make polls or ask for votes, to understand if your products or content are appreciated among your audience. If you give useful information to your social media audience, not only on products but also about your niche, you will build credibility for your brand. Spread your knowledge and expertise on content sharing sites, will help you build reputation about you and your activity. This also contribute to the creation of useful links with other people in your niche. You may want to offer discounts and special offers via your social media accounts. If you achieve to create a happy customer via Twitter or Facebook, you will receive social signals and recommendations from your users to other potential customers, with consequential creation of sales opportunities. If you provide your social media audience with regular information, you will receive credibility to your brand. If you invest your time to answer to individual questions, comments or concerns on a public page or forum, you will receive trust to your name. There are many sites where people go to ask questions that are niche-specific. You should visit these sites and provide answers to questions that have to do with your niche: this will help building your reputation. You need to search for a social media network or group where there are people with the same interests in your niche and participate to these communities. You will find in these groups, more audience that is already interested in your services and products. Take advantage of this networking, with promotional opportunities. All the people want to receive a personal touch. Be sure to create stronger relationships with your social media audience through personalized answers and information sharing. Tip: remember, people react on emotions! Do not even think about use all these tools together. Just try them and see which ones work best for you. You can stick with 2 or 3 of them. It is important to check them regularly, in order to collect useful information, that you can use to improve your social media performance. And remember, Be Social and Be Real! Are you investing a lot in your Social Media Marketing or do you focus on strategies? I would love to receive your feedback in the comments below. Thanks! The use of social media to increase a business should be a proactive approach. One must not just sign-up with a social platform and expect ‘things’ to happen. There is need to build value and credibility. If a business becomes credible on the social media as a result of the useful information it shared, then it becomes easy as well to attain useful brand loyalty. Social media can be leveraged for optimal business growth. Lets continue taking advantage of it for optimal growth. with the advent of social media getting in touch with your audience has become much easier. Businesses should care about opening profiles and accounts at mayor social media networks, in order to increase engagement with their audience and improve interaction. Its good to know your favorite social media platform is Twitter. Mine is LinkedIn and Twitter together — if you know what I mean! Yes, having account in major social networks and participating thereof is good for increased engagement! These days, I concentrating more on Social media for content marketing. Apart from social media I’m enjoying spending my time on content curation sites and blogging communities. These sites not only help in content promotion but also very good for building connections with others. I landed on your post from kingged, and this is value a blogger get from being active in communities. One more thing; your blog’s look is pretty awesome. you mentioned a nice topic. Content curations sites and blogging communities are great for finding new connections, increasing your authority, by sharing your expertise. I’m following this method since a few years already, getting awesome benefits. Glad you found my post on Kingged, thanks for commenting! Question is… How to gain website traffic and attention through social media? This article has a list answers. The tips above can be applied on every social media platforms like Facebook, Twitter, Instagram and Pinterest. Building your social presence will start with creating a complete social media profile. Why it’s important? A complete profile will magnetize interested visitors to know more about you, your business and so on. Sharing updates, helpful and relevant posts, using hashtags and so on are some tricks that are small but terrible. Responding to queries builds trust. You can gain free traffic with the use of social media. Be consistent in giving reliable resources, responding to comments, participating on forums and so on. It’s worth the effort of creating success. All in all, using social media for marketing can enable small business looking to further their reach to more customers and increase their business. I love Twitter, but I also like to invest my time on other networks, like Google+, Instagram, Facebook and Pinterest. I’ve recently written a post about new social media I found on the internet, they seems interesting to me. Be sure to do social media marketing the correct way. Filling the profiles, answering to your audience comments, interacting the right way, without spamming! Another interesting and useful post. yes social media is very trending in business world. Many people use it for many purposes. Many business man use different social media platform for their business. To use them all they promotion or advertise their business. As a result they found leads for their business and increase their customer day by day. Social media is very cheapest and effective way to connect with lots of people in one time. In your post you tell lots of useful tips that give excellent result to any business. They are are very good and helpful for many people like business man, bloggers and also other people who promote anything on Social Media. Social media is just awesome for promoting ourselves and our sites. Also, for businesses is great for increasing awereness of their brands among their audience. But be sure to do it the right way! You have Discussed Very vital subject, in fact it’s the key word is social media, its very well to blogging. This is really a great article. it covers almost all the aspects a business needs to run a successful Business Campaign in social media. I know how important is that today, specially the personal branding part. I guess it takes a lot of hardwork but I will keep on trying. Social Media has been becoming more attractive to many business as you can see all the integration from websites, blogs and on cell phones. It would be a wise choice for many business to take advantage of this opportunity since their target markets are using them for personal use. It’s a great way to expose how competent you are and also to brand yourself quite well.. I know in the past, it was more considered “Child’s play” since mainly you seen teenagers and solopreneurs using social media, but now since social media is more fine-tuned than it was just a couple of years ago, there are many who actually gain a lot through build residual income just from the tools within social media. Yes, you definitely want to use 2 or 3 of the ideas you mentioned here to see how well it works for any entrepreneur and business. Using Facebook ads and blogging communities like kingged.com has been working quite well! Thanks for the share Erik! Have a great weekend! and then interacting with them. “Be real, be honest, be yourself. I think this can also be applied by businesses when engaging with their audience via social media. Hello Erik, Hope you doing well! I found your post on kingged.com, it’s very useful and informative article. A business need new customers to earn growth and profit. Social media is the greatest way to target your audience. Social media channels are a hub of all types of users including students, business person, employees at government and private companies, retired people etc. glad to hear you found my post on Kingged. Social media is great for boosting your online presence, right? Also blogging communities are an awesome method to find your audience and interact with them. Thanks for reading, and for sharing your views! I completely agree with you when you say that traditional methods of outbound marketing are becoming less effective. More and more businesses are finding that the cost of customer acquisition using outbound marketing methods is increasing exponentially these days. The Social Media / Inbound marketing approach is making such a positive difference to business income that is only short sightedness that can cause a business to ignore this technique. Using Social Media to – Listen / Engage with you customers is becoming a way of life today from the small business owners to the huge brands. I honestly believe that the large brands are turning to using this technique largely because customers are causing quite an impact on their business income using social media. Engaging with customers and/or potential customers on key social streams should be part of every Internet driven business, marketing strategy. I believe that all Internet business owners must focus on building credibility and trust, its only subsequently that business follows. If the business experience is excellent customer loyalty comes in which leads to advocacy. Every business owner needs customer advocates, then their business – Selling – subtly shifts to the shoulders of their customers. In a word – Awesome – position. Thanks for this really well presented and informative Blog post Erik. Really enjoyed the read. Glad to hear you enjoyed the content and you confirm my points. Like engaging with your audience and interacting with your readers. It’s indeed very important to be real, as noone wants to be fooled. is a great way to create new connections. One of the most important things to do in business (and life) is building relationships that last forever! And from which you can get awesome benefits, by also offering your part. Social media is really vital for any business and anyone using it, has to use it effectively for it to increase business for them. Specifically, you’ll be rewarded with points #1, 4 and 6 if you’re vigilant enough and execute correctly. #9 is really important. You have to build relationships to succeed in anything. Thanks for liking my points, glad you enjoyed the reading. And yes, building relationships is really, really important! Both for business and for private life. I always look for cultivating my connections. I enjoyed to read out entire post. Participate in community is a great method to increase followers and business. I also join some community kingged, Bizsugar etc to increase my website visitor. I also think social media can play a very important roll in business. An effective use of social media can bring great success in business and your tips may be great helpful to all. Nice share. Use of social media is must now. I agree with all your points especially the 9th one, Brands and business owners should stress on two way communication and answer the queries of their customer. Indeed awesome post, Social media always plays major role in business promotion. More and more businesses are finding that the cost of customer acquisition using outbound marketing methods is increasing exponentially these days. Strong Points you mentioned where. Social Branding is extremely necessary specially to decrease dependency on search traffic and creating loyal user base. Great post by Erik and thanks for your brilliant views about social media business strategy. Social media is increasingly used by numerous e- commerce organizations to build a global customer base. Some of the ways by which social media can help your business organizations are building of the trust and credibility among customers, improving the online presence of the business organization, attracting customers towards e- commerce site through exciting offers and customer service and other such factors. Further, in order to track the progress and working of your social media strategy, business organizations need to use various heat map based tools like Crazy Egg, Mocking Fish, Click Tale and such others. But, Mocking Fish is the best among them due to its low price, simple dashboard design, easy implementation and provides free lifetime account facility. Well indeed social media is a great tool for promoting our online or offline business. It will surely generate good amount of leads through a quick promotion. According to me, creating polls and asking your followers and fans what they want from us is the best way to increase your business through social media. The second best way is to offer them a freebie of one of your best products to increase their trust and to show them that your products are genuine and no scam. Thanks for sharing your great thoughts over here. Now a days social media is very important factor for your business. I really don’t have ideas about klinkk, dosplash and blokube community rest of them i know very well. You can aslo add aha-now blogging community which is also one of the best community. The need for small businesses to have an online presence is becoming increasingly important. It is really hard to be on top in the business industry especially in today’s marketplace. I am using yahoo and quora, but I am still looking for other forums that I could join. As a small business owners, I am having a hard time competing with other businesses for they have some SEO experts on their sides. The best thing that I am doing right now is engaging to forums and having a conversation on social medias, especially in twitter. Using some hashtags will also help to find a relevant conversation. Hi Erik! this is truly a great piece of information you have shared. Social media has become one of the fastest way to market your business and without any doubt it can leave a great impact. In recent times, social media is also bringing so many tools which can help to increase the business. Its really great that every point you mentioned is very precise and holds a great impact if followed well. Lastly, I liked the last tag line: Be social and be real. Its one of the most authentic piece of words I have read in recent times because doing he both at the same time takes some guts. I ll waiting to hear more from you in the future. Cheers. Hey this is nice idea about using social media. I have not thought about this is also possible to use for increasing the business. This is also good idea for getting more visitors for website. I will surely going to try this trick for me. Thanks for sharing this post with us. I feel like using social media is a way to put up virtual signs about your business. Not only do people see the info just as they would a sign on the road, but they can immediately ask questions. I actually like to put social media links on physical signs as well just because of how great it is to interact with customers online. Social media plays a great role in establishing a decent online presence. Businesses can use hashtags to improve their social reach and boost brand awareness by finding out favoured hashtags related to their services or relevant to their target audience that can really make the difference. Social media nowadays are also used for business purposes. If you want to bring your business to the next level of applying social media page, you need tips on how to make it happen. But if you don’t have the knowledge on how to make your page presentable and efficient, this will just make your effort wasted. I’m so glad I found this! These tips are great and they honestly are going to be a huge help when it comes to the marketing portion of any business. Having the right assets and creating the proper hype around your business can make all the difference! Thanks so much for sharing! Social media plays a great role in establishing a decent online presence. Thanks for sharing your knowledge and it is true that social media plays very important role to increase business growth. No Doubt!